Most directors of Not for Profit organisations spend the equivalent of seven working weeks a year on their director’s duties – with almost 90 percent doing so on a voluntary basis, according to a study by the Australian Institute of Company Directors. 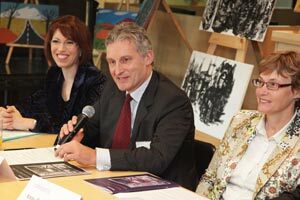 Photo: Tristan Wills, Executive General Manager, Corporate Sustainability, Commonwealth Bank and Director of the Humour Foundation; Martin Watkins, Vice President of Mission Australia; and Anne Robinson, Chairman of World Vision Australia, and Deputy Chair of the Not-For-Profit Sector Reform Council at the 2011 Directors Social Impact Study launch. Most non-executive directors of Not for Profit organisations spend the equivalent of seven working weeks a year on their director’s duties – with almost 90 per cent doing so on a voluntary basis, according to a study by the Australian Institute of Company Directors. The study, based on almost 2,000 individual members of the AICD, found that nearly 60 per cent of company directors surveyed currently serve on Not for Profit (NFP) boards, with almost 50 per cent holding directorships with more than one Not for Profit organisation. The Australian Institute of Company Directors (AICD) released the findings as part of 2011 Directors Social Impact Study, which examines the contribution that Not for Profit directors make to their organisations, to the community and to the sector as a whole. Interestingly, 50 per cent of the AICD respondents thought the quality of governance within Not for Profit organisations was just as effective as for-profits. This finding differs from the 2010 Productivity Commission report into the Not for Profit sector which suggested that overall governance and accountability arrangements in the NFP sector had not kept pace with international trends. Image (l-r) : AICD WA Division President and Chairman of the Brightwater Group, Steven Cole and Director of Research at the Centre for Social Impact, Les Hems, at the launch. AICD WA Division President Steven Cole says this study recognises the great work being done by the NFP sector in Australia and highlights the role and governance contribution being made by its directors to assist in the delivery of better performance outcomes, accountability, and better risk management. Cole was joined by Les Hems, Director of Research at the Centre for Social Impact, who conducted the study, as well as other AICD members and sector leaders, including Vice President of Mission Australia Martin Watkins and Chairperson of World Vision Australia Anne Robinson, who spoke as part of a panel discussion at the launch event held at the Mission Australia Centre in Sydney’s Surry Hills. Hems says of the AICD members who responded, almost half are involved with the largest NFPs – those with turnovers in excess of $5 million. The research showed that activities performed by directors of Not for Profits closely mirrored those of for-profit directors, however the panel stressed that the complexity involved in NFP governance far outweighed that of a for-profit company. The research shows that one of the key differences between for-profits and NFP (particularly with large NFPs) is the level of complexity that NFP directors are confronted with. Hems says NFPs have multiple stakeholders, they are not just responsible to and reporting to shareholders, but beneficiaries, funders, members, community donors and volunteers. He says the resource base that organisations use is also different – NFPs receive funding from a myriad of sources all of which directors have a responsibility to govern. More than 50 per cent of directors surveyed had been involved in the setting up or closure of a NFP, a merger of two or three NFPs or had been in the situation of facing insolvency. All of which are situations requiring good governance and leadership. The report comes at a significant time for the federal government who recently announced the establishment of a statutory body to oversee NFP sector reform. Known as the Australian Charities and Not-for-Profit commission, it will be in effect from July 2012. 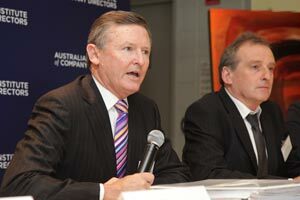 The announcement followed the Productivity Commission’s February 2010 Contribution of the Not for Profit Sector Research Report, which revealed that there are more than 600,000 Australian Not for Profit organisations contributing $43 billion to Australia’s GDP and employing 8 per cent of Australia’s workforce. Cole says any reforms need to be mindful of the significant numbers of volunteers working for NFPs, including directors, and regulatory changes should not discourage this contribution by imposing excessive regulation and compliance. Cole’s concern reflects the finding that compliance was within the top 5 areas of activity that directors spend time on in both for-profit and NFPs. Commonwealth Bank partnered with the Australian Institute of Company Directors and the Centre for Social Impact to produce the study. Download the full Directors Social Impact Study 2011 here [PDF]. This story was filed by Pro Bono Australia's Sydney correspondent, Tamara Newman.